Ronda Sprague believes learning music should be fun. She uses a variety of contemporary teaching methods tailored to meet individual student's musical aspirations. In 2006, Mrs. Sprague became a licensed Musikgarten instructor. She has completed all levels of Musikgarten training and has participated in several workshops with exceptional teacher trainers including Lorna Heyge, Jill Hannagan and Mary Louise Wilson, co-authors of the Musikgarten Keyboard program. In 1983, she graduated from Butler University (Indianapolis) with a Bachelor's degree from the School of Fine Arts. Throughout high school and college she participated in numerous bands, orchestras, ensembles and festivals. Her coursework in college included classes in music history, music theory and music education. While attending Butler she studied flute with Francis Fitzgerald, Associate Principal Flutist of the Indianapolis Symphony Orchestra. She regularly attends area workshops and seminars to hone her teaching skills and get the latest information on teaching methods. 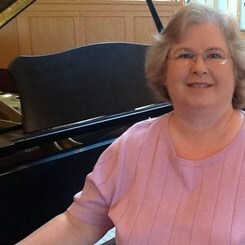 She serves the greater Manassas musical community by working as treasurer of the Manassas Symphony Orchestra and board member of Piedmont Music Club. Many of her strdents participate in NFMC Manassas Festival. Request Lessons with Rhonda Sprague today!